This t-shirt was designed using Open Source software. 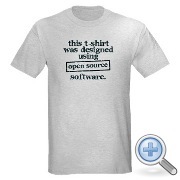 With this t-shirt, you can just walk around and show everybody how much you care about Open Source. It was designed using The Gimp, an Open Source image manipulation program,and it comes comes in natural, ash gray, and light blue colors. 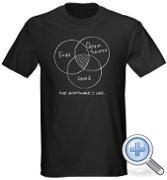 Don’t you want to show the World your support and affection for Free and Open Source software? Straight from this strip, a t-shirt that comes in several colors. State your message loud and clear: you don’t want to be distracted when you forge your awesome code. Check out the full-size image printed on the mug here. Brought to you by ObjectGraph LLC, this iPhone application will let you read the old Geek Hero strips wherever you are! PS: check out more cool apps by ObjectGraph LCC!